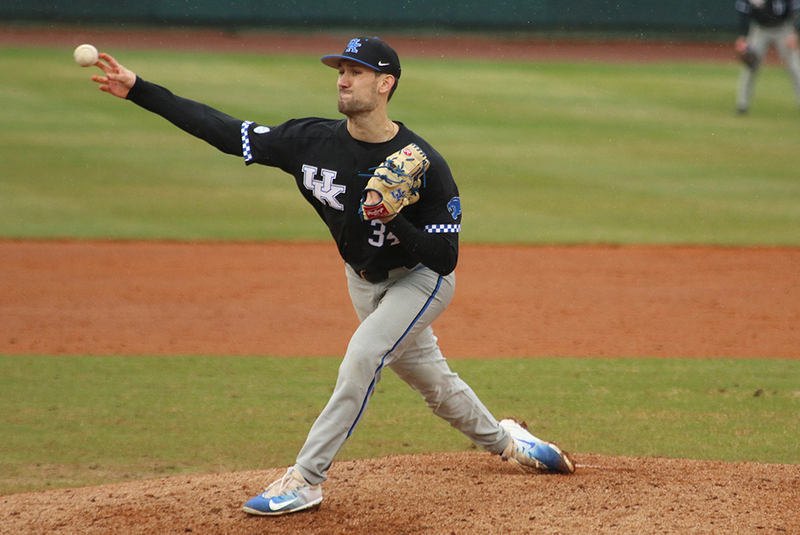 CATS lose three to #10 Tigers. 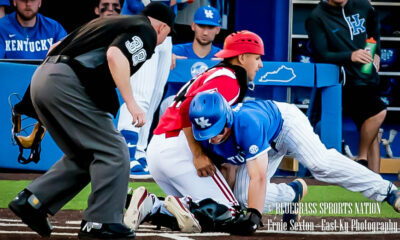 The Kentucky Wildcats traveled down to Baton Rouge this weekend for a 3-game series against the #10 ranked, Louisiana State University Tigers. The Wildcats are coming into the series with a 13-4 record and on a 4-game win streak looking to pick up a few SEC wins this weekend. The Tigers are coming into the matchup with a record of 13-5 overall and 1-0 in the SEC. These games are Kentucky’s first SEC games of the year and are looking to get a good start in conference play, hoping to be a contender at the end of the season. 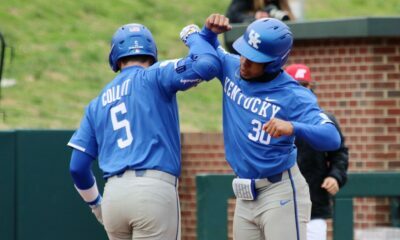 To start the first game Kentucky got on the board early in the top of the first to set the tone with TJ Collett hitting a single up the middle to score Breydon Daniel to give the Cats a 1-0 lead. Neither team scored again until the eighth inning. In the bottom of the eighth inning, LSU had bases load and unfortunately J. Ramsey walked Bianco to tie the game up at 1-1. The game remained tied and went into extra innings. In the bottom of the twelfth inning, LSU had bases loaded again and R. Johnson walked DiGiacomo to give LSU a walk off win with the final score 2-1. Trip Lockhart got the loss for Kentucky putting him at 0-1 on the season. LSU’s Devin Fontenot got the win putting him at 3-0 on the season. The next game was a double header, with a game time of 7 PM, but started late due to the first game going into twelve innings. LSU got on the board first this game, in the bottom of the first inning Reid double, scoring Duplantis and Watson putting the score to 2-0. The Wildcats countered in the top of the second inning, with Cam Hill reading on a fielder’s choice and scoring Dalton Reed to put the score to 2-1. In the bottom of the second inning LSU scored six runs to put the score to 8-2 with five of the six runs being unearned. LSU added another run in the bottom of the third inning with it being unearned as well putting LSU up 9-1. The Cats fought back in the top of the fourth, scoring two runs, but LSU countered that with 5 runs putting the score to 14-3. Eastern Kentucky phenom Braxton Cottongame, who was drafted straight out of high school got his first chance pitching in the South Eastern Conference as an 18-year-old true freshman who is 6’3 and weighing around 205 pounds. Braxton threw two complete innings for the Wildcats. As an18 year old true freshman, facing the #10 ranked team in college baseball, Braxton threw 33 total pitches with 21 of those being strikes. Braxton struck out one batter and allowed three hits and gave up two runs against a tough LSU team. We look forward to Braxton getting pitch a lot more this season. The Wildcats ended up losing the second game with a final score of 16-4. Grant Macciocchi was given the loss for this game putting him at 1-1 on the season and Cole Henry was given the win for LSU putting him at 1-0 on the season. These two teams faced off again Sunday with a game time of 3 PM. The Cats were looking for redemption and hoping to at least come home with one win. D. Marsh was given the start for the Wildcats and Walker was given the start for LSU. This game was scoreless until the bottom of the fourth inning when LSU’s Garza singled to center field, scoring Reid, which was an unearned run. The Cats tied it up in the top of the fifth inning with a squeeze bunt from M. Gei, scoring C. Kessler to put the score to 1-1. LSU scored 3 more runs in the bottom of the fifth putting the score to 4-1 and then scoring 3 more runs in the bottom of the seventh. TJ Collett hit a solo homerun for the Wildcats in the top of the eighth inning putting the score to 7-2 and this remained to be the final score. 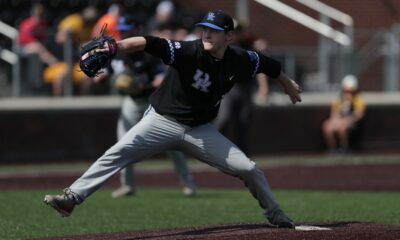 UK freshman Hunter Rigsby from Rockcastle County was given the loss for todays game putting him at 1-1 on the season. LSU’s Matthew Beck got the win putting him to 2-0 on the season. The Cats start SEC play out 0-3 and putting their total record to 13-7. The Cats are 10-1 at home and 3-6 on the road. Kentucky comes home for an eight-game stand hoping to regroup and pick up some wins. The Kentucky Wildcats face Xavier, Tuesday at 6:30. 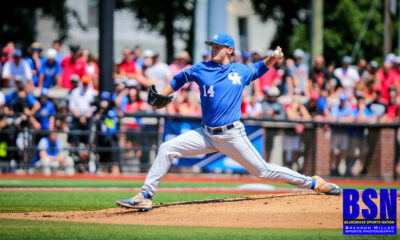 Kentucky left 31 runners on base this past weekend against LSU and committed five errors. It’s still early in the season and a lot of baseball left to play. Everybody get out and try to watch the Cats as the weather is supposed to start warming up in the Bluegrass and a chance to check out the new stadium.